I Vote for Women focuses the voting and financial clout of women to elect women candidates that support building and sustaining a strong economic base of opportunity and security for women. Our Position Guide is provided along side each federal candidate's profile to assist women in understanding the views and commitments of women candidates. The Position Guide is derived from the chamber's report on Women's Economic Priorities. Please view Women's Economic Priorities online now. You may also download the Women's Economic Priorities report as a PDF. Women are an important economic force in America who have, for too long, been undervalued and underrepresented in political leadership and policy making. For more than two decades, women have lead the growth in America's Gross Domestic Product, driven the creation of new businesses and jobs, moved into leadership roles providing financially for our children and families -- and now, we also hold The Majority Vote. But, even with our sizable contributions to the American economy, there is much left to do to support our economic opportunities, independence, security, values and family well-being. 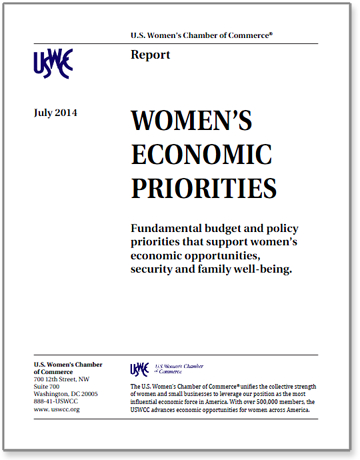 Through this report, your U.S. Women’s Chamber of Commerce highlights the contributions we have made to America, outlines our current economic condition and states clearly the types of federal budget and policies that are vital to support Women’s Economic Priorities. We call upon you to hold America’s Political Leaders accountable. We are students, workers, mothers, business owners, retirees, consumers and The Majority Vote. We are the New American Leadership. A positive economic environment: Women need governmental policies, budgets and leadership that support us as students, workers, mothers, breadwinners, caregivers, business owners, retirees and policy leaders. - Job creation, full employment & GDP growth. - Family-friendly work environments that provide equal opportunity, advancement, human rights, fair pay, a living wage, personal safety. - Access to affordable, quality healthcare. - Tax policies that support a strong middle class and do not provide unwarranted loopholes, privileges and giveaways to big business and elite influencers that drain and destabilize our economy. - A safety net that supports economic security and mobility and strengthens our economy. - Access to affordable, flexible and quality education. Affordable access to home ownership. - Access to the tools that drive business creation and growth. - Fair access to federal contracts including overseas opportunities. The full report includes important statistics that will surprise you, insights into women's roles, what we contribute, and detail on our priorities. Read the report here. Or, download the PDF.